Editor’s note: Lynn Sures was invited by the Art In Embassies Program of the US State Dept. to participate in their “American Artists Abroad” program, spending a week working–lecturing, teaching workshops, and making studio visits–in Colombo, Sri Lanka with artists and students from the area. To allow for the “exchange” part of my cultural exchange visit, I had a week to get acquainted with this island country off the southeast tip of India. Hence the invitation to accompany Ambassador Jeffrey Lunstead, his wife Debbie and their daughter Julie, on a driving tour prior to the start of my official program. At the Pinnewala Elephant Orphanage, a wild elephant rescue center, we watched the babies, juveniles and adults from the rocky bank of the river. Bodies eroded the bank of the opposite shore, rubbing to cover their backs with dirt. A crowd of elephants swam through the wide river. Elephants gathered at the base of the hill road and began the ascent in a line. 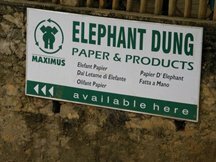 I viewed a multitude of hefty posteriors, a portent of the locally celebrated elephant-dung paper, which uses pachyderm-digested cellulose pulp to make artist’s papers, blank books and other products. With crowds of pilgrims making flower petal offerings we took in the pulsing ensemble of architectural detail, torches, and the thunder of drums at the Buddhist Temple of the Tooth in Kandy. Later I fell into my netted bed. Jet-lagged, awakening hours before my hosts, I was bombarded by the paintings covering the hotel walls, then by the view from our mountainside. Drawing helps me to focus; I drew a pen-and-ink of the exotic, curious vegetation. On the street I spoke with some auto-parts storekeepers who engaged this American in discussion. They were at first polite about stating their feelings regarding my country’s international policies; I invited their frankness, offering my own. They noted their concerns about practices in Sri Lanka surrounding distribution of tsunami aid. At the Kandy open-air market I made another stab at conversation with some spice merchants, finding it easy. In a ferocious rainstorm my hosts and I navigated the twisting road over the Knuckles Range, treated en route to the green, orderly beauty of a mountain-top tea plantation. The wild ride ended in the flatlands, in remote Dunuvila, by a flooded area known as a “tank” that serves as a lake. Designed by Sunela Jayawardene, the largely mud house where we stayed was open-air, structured with found wood and other non-intrusive materials, using solar cells to afford a dim evening light. Here I began to distinguish the local food, as two young men from a neighboring farmhouse cooked string hoppers and coconut roti for us. Going into little Hettipola for groceries gave me access to townspeople for some photos, and they posed with friendly pleasure. Driving along a waterway I watched women and children scrub clothing. A rented jeep carried us through the Wasgomuwa National Park for views of exquisite birds and other wildlife. For about 20 dreamlike minutes our jeep was gripped in the midst of dozens of wandering, grazing wild elephants. We moved on to the Cultural Triangle of ancient cities. Our guide in Polonnaruwa was a school teacher doing guidework for supplemental income. The scholarly richness of his discourse on historical architectural conventions and spiritual influences, illuminated by his comparisons with nearby India, animated the ruined city for us. His reply to my question shocked this privileged traveler—he had never, himself, been able to go to India, though he hoped to do so one day. The contemporary Kandalama Hotel, designed by Geoffrey Bawa, was built stealthily into a mountainside, nearly invisible until one was just upon it, with a swimming pool made to appear as if it merged into the sky. Another well-assimilated hotel in the triangle was the Lodge in Habarana, designed by Ismeth Raheem on the edge of a bird-populated “tank”. Monkeys ran all across the lawns, sometimes breaking through to the open-air restaurant. This facility improved my discernment of the local cuisine, as I studied the curd-and-treacle, sambars, curries, and kiribata through repeated sampling. Following a stream up a rocky mountainside, Ritigala was the quiet, engrossing stony ruin of an enormous, ancient Buddhist monastery. The evocative remains were framed by the jungle, by tall, multi-trunked trees and hanging greenery. We sat on the ledge of the slab which had cradled the library and gazed into the distance. 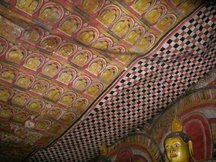 In contrast, my most electric moments took place sheltered inside another Buddhist locale, Dambulla, responding to a mesmerizing series of vividly painted temples. These were cave chambers in a rock overhang; red-yellow-black-white paint, undulating surfaces, the noise of rain, all of it thrilling. The towering mesa of Sigiriya created a confusion of emotion. Attention shifted constantly: natural designs of clustered boulders, evocative ruins in the lower city, views of the seven beauties painted in the elevated caves; awareness that climbing the cliff to the top was moving me to terrified vertigo; absorbtion in the 360-degree-vista from the upper city. After the intensity of Sigiriya, the Handicraft Village outside of town created a peaceful counterpoint. Demonstrations by artisans of metal embossing, weaving, wood carving and lacquering inspired another kind of visual reverie. During the week I became aware of the feeling of familiarity. It became quite normal to be in rural Sri Lanka, see the landscape and vegetation, know some history, expect the little shops and fruit stands lining every street, smile at people in sarongs and saris, hear the languages, eat the food, and watch the animals stroll the streets. A week working in Colombo awaited. 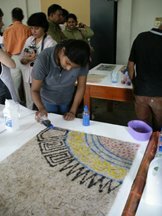 My goal was to meet Sri Lankan artists and exchange information with them, by means of lectures, pulp-painting workshops, and artists’ studio visits. Many locals had already seen my pulp paintings, two nearly 4’x8’ landscape works made of flax, at the Ambassador’s Residence exhibition during the previous two years. It was a good place to give a slide lecture about the evolution of my paintings, sculpture and artists’ books. The artists, architects, papermakers there were excited about the medium, and the possibilities for their own work. One professional papermaker mentioned that he was feeling, for the first time, courageous enough to try making something artistic. At the American Center I spoke about American and European artists who work with pulp painting. The delightful papermaker Ashley Mendis labored to accurately translate the talk into Sinhalese. My audience included students and professional papermakers and afterwards I was treated to examples of their products and artwork. The final lecture, on the campus of the University of Moratuwa, was about my own work and my process. Responding to what had been described to me as a rote learning system in the country, I ended up focusing on the importance of continuing the creative search, of defining the directions of one’s own work, of refusing the limitations of others’ expectations. The students were amazingly responsive, asking pointed questions and making confident statements about their own career goals. For a pulp-painting workshop series at the University of Visual and Performing Arts I had prepared and brought materials from the US. To refit a light and roomy printmaking studio into one ready for papermaking, Manisha Samarasinghe and his Chakra paper company contributed studio equipment consisting of vats and molds-and-deckles, plus a beautiful banana fiber/recycled-paper pulp. Two papermakers, Thuliya Fonseka and Manjula Abeysooriya, kindly lent their press. At my first half-day workshop the participants were seniors in Printmaking at the university. They were very quick to take to the techniques I demonstrated and produced a lot of work which ranged from beautiful to humorous. The textile teacher, Greta, in her gorgeous sari was my able translator. The printmaking teacher, Susiripala Malimboda, brought kiribata (rice milk) from his wife, so at the break we indulged in the generous snack. Following the workshop I viewed the works that the printmaking students had brought to show me, which included woodcuts done with the aid of a computer, monoprints and screenprints. Mr. Malimboda’s work, done using stencils similarly in technique to the pulp painting we did that day, responded emotionally to the 2004 tsunami. A second and third workshop included participants who were professional papermakers or artists. I worked with some outstanding, enthusiastic participants. Overall I understood the students’ expression that in the workshops something exciting was taking place, outside their normal frame of reference, and many felt the process would certainly continue in the future. I viewed a potent exhibition at the Paradise Road gallery by the artist Shanaathanan, from Jaffna. The mixed-media works on paper referenced the grave state of conflict in the north of the island, and were the most compelling work I saw on exhibit. Other strong work in galleries built upon traditional crafts, such as a forceful installation of large basket-woven forms that claimed the Barefoot Gallery space and manipulated the viewer’s attention therin. Throughout the city I also saw how pervasive were paintings that were stylistically derivitive of early to mid 20th century Western masterworks, recreated again and again by artists who, distressingly, did not trust their own voices. At the studio of mixed-media artist Anolie Perera, of the Theerta artists’ group, we viewed some of her clever and unself-conscious installations springing from domestic scenes. Theerta, which reaches out to international artists, has facilitated and participated in exchange exhibitions, thus serving an island desirous of a connection to art made outside its borders. An intimate and introspective mood existed at the studio of the painter Anoma, whose extensive work ranged from textile design, her earliest medium, to the layered, delicate landscapes of her current work. Anoma teaches classes and organizes exhibitions for her students. I also had occasion to talk with the busy and fascinating documentary film screenwriter Sharada de Saram, and the resourceful environmental architect Sunela Jayawardene. Visiting Tilak Samarawickrema, an architect whose tapestries had intrigued me, we watched his animated film of a folk tale drawn entirely using the curvaceous Sinhalese alphabet. Discussing his architectural work as well as the tapestries and animation, we traded some information about other artists from our respective countries, and we talked about how travel has enriched our artistic lives. In the art-filled home of renowned architect Ismeth Raheem we had a stimulating conversation about architecture and ecology, and about Sri Lankan artistic history and a treasured book called “Medieval Sinhalese Art.” I viewed batiks, prints and drawings done by this exceptional architect. His wife Dilini, herself an architect, crafted an unforgettable homemade ginger beer as well. How perfect it was near the end of my stay to see what might have been the origin of the poses in so many drawings and paintings I’d seen throughout the island. A working rehearsal of the Chitrasena Dance Company, headed by the dancer Upeka, presented the now-familiar use of limbs and facial expressions, accompanied by explosive drummers. Several generations of Upeka’s family have sustained the continuity of this vibrant, traditional company which also nods to contemporary developments in dance. Upeka’s mother is eyeing a gifted granddaughter, reminiscent of herself in her youth, to embody the future of the family’s acclaimed dance presence. This was all an amazing adventure, being gently stretched and pulled in every direction, receiving a lot more than I could have given. Every day I appreciated the graciousness and enormous assistance provided to me by Ambassador Jeffrey Lunstead and his talented wife Deborah Sharpe-Lunstead, who not only hosted me for two weeks but did critical planning and organizing that enabled the program to be effective. Angela Gemza and Chamalie Weerasekera from the US Embassy also contributed greatly to my program. Working with the people of Sri Lanka, it was gratifying hearing them imply plans to take place “When you come next time…” As a matter of fact, I’d be ready to do that in no time flat.